Wear this Adult Domino Costume and you can dress up as your favorite game! Maybe you love spending hours playing the classic dominoes game. Or maybe you're more of an engineer who has a passion for building complex and intricate domino patterns and watching them all fall over! The included removable dots make this costume totally customizable. Make the costume into your lucky number or perhaps go as the classic and minimal snake eyes. This domino costume makes for a great dominoes group costume! 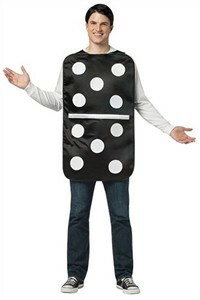 With all of your friends going as a different numbered domino you can become a hilarious set of dominoes! The possibilities are endless. Availability: The Adult Domino Costume ships in approximately 1 business day.